Retained Executive Search is a process that can be learned; choosing the best candidate is an art that only comes from experience. E.A. Hughes is a retail and consumer executive search firm specializing in consumer-driven industry sectors such as consumer apparel, home furnishings, beauty, digital, e-commerce, footwear and others, with expertise in all channels of distribution. We integrate deep and robust industry experience with a uniquely personal approach to our executive search, executive team assessment and CEO succession engagements. We go behind the resume to uncover the whole individual. Our work extends far beyond the search – we aim to ensure the optimal alignment among your executive team, your corporate goals, and emerging industry opportunities. Globalization influences companies to reach beyond their home markets and compete for talent that can help them accomplish their growth goals. 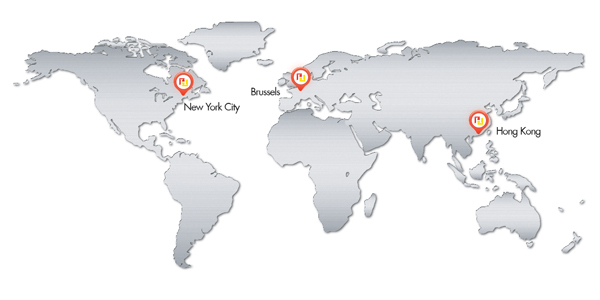 Our research associates based in Brussels and Hong Kong help us to identify talent globally. These efforts have uncovered a pipeline of emerging executives who are succeeding in their current environments and who are willing to examine more challenging roles globally.